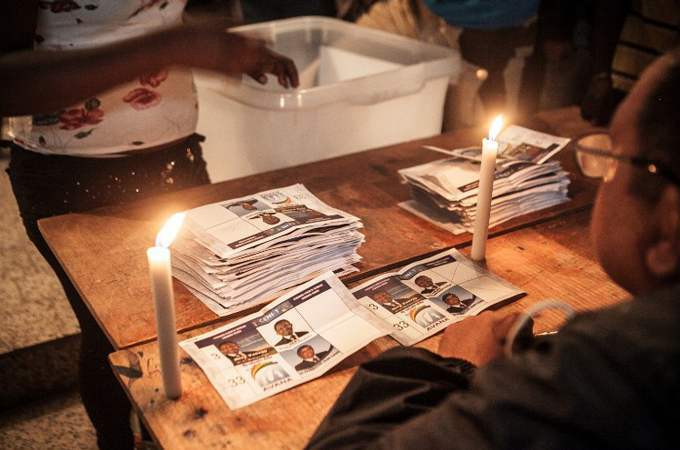 Madagascar’s historically awaited 20th of december election day took place in a calm atmosphere. It was the day of the run off between the two candidates, Hery Rajaonarimampianina and Jean Louis Robinson. They are backed by the two titans of Malagasy politics President Andry Rajoelina and ousted former President Marc Ravalomanana. There were reports of violence in the South, namely in Ikalamavony, Betroka and Midongy Atsimo. Dahalo, bandits, threatened a member of the CENIT and destroyed ballot boxes. Apart from a few incidents of violence the rest of the island was peaceful. The streets of the capital was deserted as citizens walked to their election point to cast their votes. In the evening, both candidates celebrated early victory when the first results were announced. The last day of campaigning was concluded by a heated debate between the two candidates. At the time, Robinson was ahead by a few percentage not much but still ahead. Sadly, for Robinson he was attacked by a question leading him to reveal that he is a Free Mason. Thus committing political suicide. The majority of Malagasy have an unforgiving policy toward Freemasonry. The end of the debate left many focused on that one and only slip up, especially since Robinson benefited from a strong christian support. Many share the view that it was a setup. A fact we cannot confirm but only suspect. The day following the elections were still peaceful, though presence of police and gendarme noticeably increased. International observers report a transparent elections yet rumors of pre-ticked ballots for the candidate Hery Rajaonarimanpianina worry many voters. At present the real results of the presidential run-off remain unknown. Those of the legislatives are slowly revealed. The atmosphere remain calm but somewhat tense. Four days following the elections, Robinson, the candidate backed up by ousted former President Ravalomanana complained of election fraud. According to him and his political party they have won approximately 60%. A result he claims he can prove. He warned against illegal acts perpetrated by incumbent President Andry Rajoelina to influence the polls. He announced that they are manipulating the choice of the Malagasy people. The Independent National Electoral Commission of the Transition, CENIT, which is an independent electoral body funded by the United Nations supervised the 20 115 polling stations in the country. The Southern African Development Community, SADC deployed 256 observers dispatched in 22 regions of Madagascar. The EU Election Observation Mission, UE-EOM deployed 42 long-term observers and sent teams composed of their observers and national observers covering several regions including remote areas of the country. Robinson denounces that the CENIT is involved in the fraud and that he has proof of his victory. He threatens criminal prosecution of those who perpetrated the fraud. He requests the resignation of Beatrice Attalah head of the CENIT. In the alternative that she be assisted by a “co-head”. As for the rest of Robinson’s political party, they refuse to be inactive. Their headquarter continued to receive minutes of the results. On the 24th they reported 57,37 % to Robinson and 42,65% to Rajaonarimampianina. That been said the official results will be that communicated and counted by the CENIT to be validated by Madagascar’s Electoral Court, CES. The battle of the numbers continues. Once again the population feels manipulated by their own leaders. The elections were meant to be an exit, an end of political crisis not the spark of another one. Where are we heading if our next President comes to power through a malicious process? In the hope that the choice of the people will be respected, that there were no such massive electoral fraud. The people voted, let their voices be seen through the true results. In spite of these rumours and worries; knowing the Malagasy population, christmas is a day of celebration and fihavanana. Merry Christmas and not Crisemafy Malagasy brothers and sisters ! « One nation, one people, one vote, one day … Who?